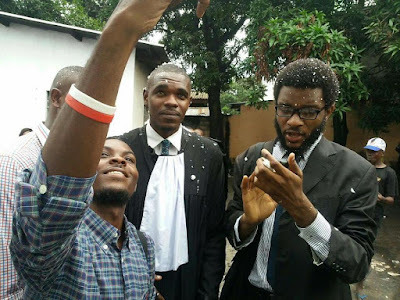 On Monday, July 17, 2017, Jean-Marie Kalonji and Sylva Mbikayi were released from the Military Detection of Unpatriotic Activities (DEMIAP) detention center. The two young activists were detained on June 23rd without being charged of any crimes. According to Jean-Marie and Sylva, the soldiers who detained them were concerned that they were working with foreign governments to destabilize the Kabila regime. They encountered many other youth in DEMIAP who were detained on similar suspicions. Unlike many of the youth who remain detained at DEMIAP, Jean-Marie and Sylva benefited from an international awareness campaign and empathetic individuals of conscience who facilitated their release. Although the Minister of Human Rights, Mrs. Marie-Ange Mushobekwa tweeted that she spoke to the head of DEMIAP to secure the release of Jean-Marie and Sylva, this account is dubious at best. The one certainty from the Minister's tweet is that she felt the pressure from the letters that were sent to her and the tweets that flooded her account. Although, Jean-Marie and Sylva are free, they are not out of danger. They are currently getting medical treatment and recovering from the harsh conditions they endured in the military detention center. Unfortunately, many youth remain locked up in the center that for all intents and purposes serves as a warehouse for hundreds of Congolese youth. Many youth have been disappeared without their families knowing their whereabouts - two such cases are Edel Mulumba and Jeff Mulungiomo of Kinshasa. In addition to the DEMIAP detention center there are other youth in jails throughout the country who have been detained; Sephora Astride Bashiya Biduaya in Goma and Nicolas Mbiya in Mbuji Mayi are two other examples. It is imperative that we advocate for the release of these youth and the countless others who linger in Congo's prisons. Jean-Marie and Sylva benefited tremendously from the support of people of conscience throughout the globe but they represent merely a glimpse into the incarceration state that Joseph Kabila has imposed on the Congolese people, particularly the youth. The widespread arbitrary arrests and warehousing of Congolese youth can surely be classified as crimes against humanity and should draw the ire and outrage of the global community. Join us in bringing an end to the unwarranted persecution and detention of Congolese youth. Friday, July 14th marks three weeks since the Congolese military picked up and detained Jean-Marie Kalonji and Sylva Mbikayi of the youth-led organization Quatrieme-Voie/Il Est Temps. Jean-Marie and Sylva remain detained without charge or access to their family or legal representation. They are still in the Military Detection of Unpatriotic Activities (DEMIAP) detention camp where detainees are often tortured and never heard from again. Owing to the gravity and urgency of their case, Amnesty International has issued an URGENT appeal for the immediate release of Jean-Marie and Sylva. The members of Quatrieme-Voie/Il Est Temps are bewildered as to why their top leaders have been shipped off to a military camp. 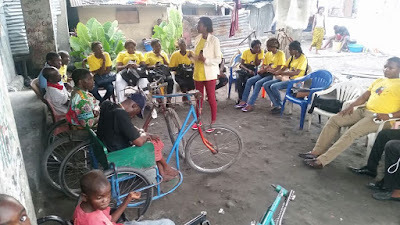 The fact of the matter is, while partnering with Congo Love, Jean-Marie, Sylva and the rest of the Quatrieme-Voie youth have been deeply engaged in serving their communities. They have assisted women and children with legal service to get them released from jail; they assist market women by providing them with benches and chairs to improve the conditions in which they sell their products; they have worked with the handicap community to provide services to them; and they launched a scholarship initiative to provide university students with scholarships to attend school. 1. Send an email to Congo's Minister of Human Rights or send the Minister a tweet to appeal for her intervention. Click here for sample letter! 3. Make a financial contribution to support the effort to secure the release of Jean-Marie and Sylva. The military intelligence department, well known as P2, arrested this Thursday 2 photography students in the town of Goma, eastern Congo DRC. Abedi Mohamed and Elie Batumike were practicing as part of a photography training during the ongoing Congo International Film Festival when they got arrested. “The agents went through their photos to check if they photographed anything sensitive and promised to release them” said Imani Nzabanita, Yole!Africa administrative assistant who went to follow up what was going on. 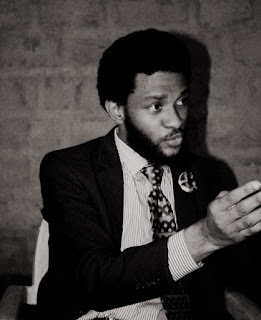 Yole!Africa’s director, Petna Ndaliko asks for their immediate and unconditional release. Recently, another group of Congolese artists were arrested during an artistic performance denouncing massacres in the region of Kasaï and Beni. They were released on bail days later. When Sylva Mbikayi graduated from law school and passed the bar exam, Jean-Marie Kalonji and friends came to celebrate his accomplishment. 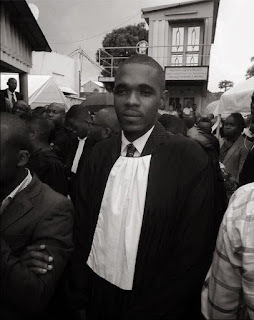 Sylva, the people's lawyer, has taken the responsibility to represent those who have been wrongfully arrested. Through a program of Quatrieme Voie, he has visited the Makala prison in Kinshasa and reviewed cases of young women jailed, some living in prison with their babies. All of this work, free of charge. Two weeks ago, he decided to take on another case, that of a Congolese elder name Papa Biko who was arrested by Congolese police simply for fulfilling his duty as a citizen by offering his space to facilitate voter enrollment. When the news of Jean-Marie and Sylva's arrest reached the neighborhood of Papa Biko, the people there said "wait, they arrested Papa Biko's lawyer too? Now they're going to see!" People are being mobilized on the ground for these two young men to be released and we will share more as they take action. It's been 7 days and we do not have at 100% reassurance about their well being. We remain faithful and continue to fight for their release. Thoughts and prayers go to these valiant fighters for Congo's liberation. We miss you Sylva and Jean Marie!